Stars form in Giant Molecular Clouds (GMCs), which are clouds of dust and gas containing hydrogen and other elements at a meager temperature of 10 K. In these conditions, gravity is opposed by the random motion of the particles, which prevents the GMCs from collapsing in on itself. The Jean Criterion dictates the point at which the gas cloud collapses. When a cloud cluster has sufficient mass as dictated by the Jean Criterion, it collapses and emits infrared radiation. All the gas in the cloud is used up and a new star known as a protostar is formed. The outward radiation pressure from the protostar is balanced by its gravity, and now the star lies on the stable main sequence in the Hertzsprung Russell diagram. Helium produced by the nuclear fusion reaction sinks to the core. Eventually, the pressure and temperature are not conducive, so the fusion process slows down. The star begins to collapse, which in-turn increases the core temperature. This heats the outer layers of the star, causing it to expand. The star has now become a Red Giant, and so it lies in the top right-hand corner of the HR diagram. It is extremely luminous, but its temperature is really low. According to the Pauli Exclusion Principle, electrons cannot have the same quantum numbers. So, as the star collapses, at one point, the electrons cannot come any closer due to electron degeneracy. As a result, the core gets hotter and hotter, but it cannot compress any further. This results in the maximum density of the core. The helium in the core fuses to form beryllium, which in-turn reacts with hydrogen to form carbon. Carbon then fuses to form oxygen. The production of these three elements is known as the triple-alpha process. Subrahmanyan Chandrasekhar FRS PV, was an Indian American astrophysicist who dedicated his life to understanding the evolution of stars. 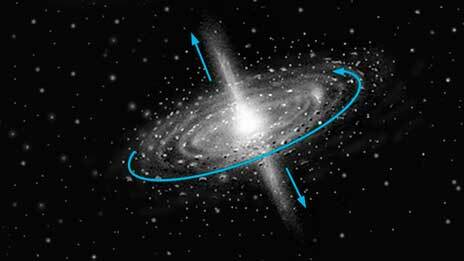 If the system is a binary system, in which case there will be two stars, the two bodies attract matter from each other. As a result, their mass exceeds the Chandrasekhar limit, and so electron degeneracy doesn’t limit to what extent they collapse. Consequently, the heavier elements continue to fuse. This results in a Type 1a Supernova, which has a luminosity of 10000000000 times that of the Sun. Fusion of heavier elements continues and these sink to the core of the star. Iron is produced, and iron fuses to form even heavier elements. However, this takes up energy, unlike most nuclear fusions. The core collapses, as there is no energy production. The temperature is continually increasing, as well. Iron undergoes nuclear fission, and this reduces the outward pressure. Thus, gravity overpowers and causes the core to collapse in on itself. As the mass is much greater than the Chandrasekhar limit, there is no limit to electron degeneracy. So, the protons combine to form neutrons. The core contains only neutrons, but Pauli Exclusion Principle also applies to the neutrons. Consequently, they collapse until reaching neutron degeneracy. This takes about 0.25 seconds and creates a gap between the core and the outer layer. When the outer layer falls into the gap, the temperature increases rapidly, and there is a huge explosion. This process is known as a Type II Supernova. The end product of this process is a neutron star. These stars follow steps 1 to 6 (from above), however neutron degeneracy doesn’t limit them because the stars are so massive and have a core that is greater than the Oppenheimer -Volkhoff limit (3 × Mass of Sun) So, the star continues to collapse to a point, which is known as a singularity. A black hole is formed. Great refresher for me. I took Astronomy last year and it blew my mind! I got to meet Subrahmanyan Chandrasekhar briefly when he gave a talk at the Very Large Array. Mind blowing talk. Wow! That’s incredible! When was this?? I believe this was spring of 1989, not too long after he won the Nobel Prize.